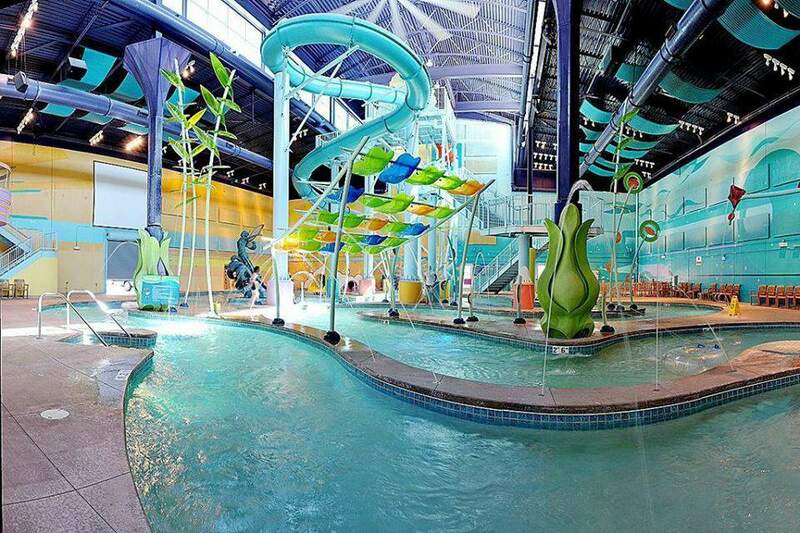 At 30,000 square feet, the ABQ Surf N’ Slide indoor water park at the Wyndham Hotel is comparatively small. But it does offer a surprising number of attractions that'll get you and your park posse wet—and a bit wild. It is the only indoor facility in New Mexico and therefore the only place in the state to find year-round, weatherproof, water park fun. Compared to larger indoor parks, such as the Great Wolf Lodge in Texas, it is lacking a wave pool and other standout attractions such as a funnel ride, a bowl ride, or a water coaster. ABQ Surf N' Slide does, however, feature a FlowRider wave simulator. By generating powerful jets of water, the attraction allows water park guests on boogie boards and Flowboards to challenge never-ending waves for both body and stand-up surfing. The park offers surfing lessons on its FlowRider for an additional fee. For moderate thrills, the park also has two water slides, one that uses rafts, and one for inner tubes. Other attractions include a lazy river, an interactive water play structure with a tipping bucket, an indoor/outdoor whirlpool spa, and an activity pool with water basketball. For younger kids, there is a wading pool. The water park is available to registered hotel guests of the Wyndham, but is not included in the regular room rate. Water park packages, which include a hotel room and water park passes are available. Day passes for the general public, group packages, and birthday packages are also available. The park offers season passes as well. The water park is open year-round, but closed on most Mondays, Tuesdays, and Wednesdays. Check the ABQ Surf N’ Slide's official site for actual days and hours. There are no dining options inside the water park, but the hotel offer Altitude Sports Grill, which specializes in green chile-infused dishes. Other eateries include the Manzanita Grill, a cafe that serves breakfast, and a small Starbucks. The Wyndham’s 300 accommodations include standard rooms and suites (featuring bi-level lofts). In addition to the water park, the hotel offers an indoor pool and a lap pool. There is also a fitness center as well as meeting and banquet facilities. The physical address is 2500 Carlisle Boulevard NE in Albuquerque. The water park and hotel is located on I-40, near the I-25 Interchange. From the east: I-40 West to the Carlisle Blvd. exit. From the west: I-40 East to the Carlisle Blvd. exit. From the north: I-25 South to I-40 East to the Carlisle Blvd. exit. From the south: I-25 North to I-40 East to the Carlisle Blvd. exit. Cliff's Amusement Park is in Albuquerque. Among its thrill rides is the New Mexico Rattler wooden coaster and The Sidewinder pendulum ride. It also offers family rides, kiddie rides, games, and food. Cliff's includes outdoor water park fun, WaterMania, which is included with admission.